Of A Revolution, or O.A.R. as they’re more commonly known, rocked the Sands Casino Thursday night. The band put on a high-energy show that lasted a good two hours, featured 22 songs, and had fans, including those in the seating on the side of the venue (which was around 80% full), standing and grooving the whole time. O.A.R., who have been around since 1996 and still have all 4 original members, were touring in support of their newest album The Rockville LP which was released in June. The band played 4 songs off the new album (“Two Hands Up”, “Peace”, “Place to Hide”, & “Caroline the Wrecking Ball”) which lead singer Marc Roberge has said was a deliberate effort to reconnect with their roots. Out of all the songs played live from the new album, I enjoyed most hearing “Two Hands Up”, a song that sounds more like older O.A.R. material and infuses jam rock and reggae into an anthem that had the crowd throwing their hands in the air. O.A.R. excels when they let their musicians shine during various times throughout their set. Saxophonist Jerry DePizzo’s horn solos were very impressive and on par with some of the best live band sax performances I’ve seen. Keyboardist and percussionist Mikel Paris also was on point all night long and he helped to keep the diversely-aged crowd energized throughout the set. Marc Roberge didn’t talk with the crowd a lot (he went about ½ of the show before he acknowledge the fans. He apologized for not doing so sooner but said he just gets real pumped up to play music and have the fans sing along to it) but you don’t go to see a jam band to hear them talk, you go to hear them groove for a long period of time. 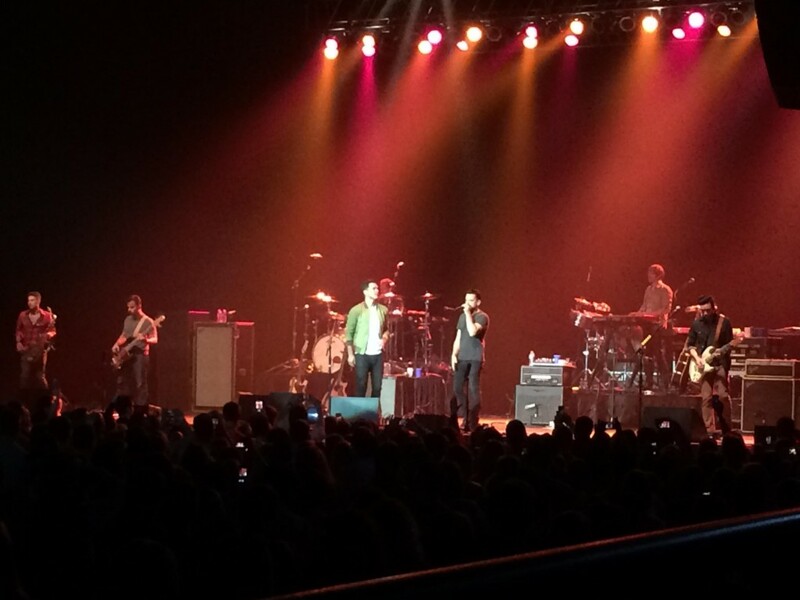 Singer-songwriter Andy Grammer was the opening act, and he was definitely one of the highlights of the night. I’ve heard and enjoyed some of Grammer’s songs before (“Fine By Me,” “Keep Your Head Up”) but I was surprised by just how talented of a musician he was. Grammer was a true one man band; He sang and played the acoustic guitar all while creating percussive and keyboard sounds which he’d loop via pedals to accompany him through his set. I can’t stress enough just how much musical work he (and his FOH guy) put in during his set, and besides one song that he wasn’t happy with how it sounded, it was a very impressive set. He also broke out a keytar once, which is always a win in my book. I also really enjoyed one of the songs from his newest album, which was called “Back Home” and the crowd loved the song he ended his set with, a cover of Coldplay’s “A Sky Full of Stars”, which I personally enjoyed more than the original. Grammer was an awesome choice to open for O.A.R. and I hope he has a tour of his own (with a longer set) that will bring him back this way sometime in the future. The show ended with O.A.R. returning for an encore where they performed “I Feel Home”, one of their deeper cuts and a crowd favorite. They then broke into one of their oldest hits “That Was a Crazy Game of Poker” which had fans in the standing section throwing playing cards in the air throughout the song. The song then transitioned into a cover of Bob Marley’s “No Woman No Cry” which saw Andy Grammer return to the stage to sing along with the band and would end the night. I will admit that even as a fan of O.A.R. before tonight, this was actually the first time I saw them in concert. I know now that one thing is certain when you see an O.A.R. concert: you will absolutely get your money’s worth. O.A.R. has built their own revolution of fans online as a tech savy band that sells high-quality audio recordings of live shows and shoots on-the-road home videos. This has helped to establish O.A.R. as a band with a large following and fans that travel to multiple shows. I ran into a buddy from college at the show who has seen O.A.R. some 25 times and he thought it was a great show. Whether it’s your first show or your 25th, I don’t think you’ll leave an O.A.R. show disappointed. See them!